Here are the nominees for the 2016 Brickfilmer's Guild Film Festival. BreaksBricks - LEGO Arcade Robot Breakdance Battle! A results awards video/podcast is forthcoming. Thank you for your patience. For a list with links to videos, click HERE! Super excited to get three nominations! I do want to make sure it's clear, though, that the score from The Small Nap is by Kevin MacLeod, it's not original. You film is up against several films that did do their own score, but your use of Kevin MacLeod music evidently was done well enough to get you in the top 8. Congrats also on the cinematography and voice acting noms. The 5 judges essentially made top 10 rankings for each category and those scores were added up. The top 8 (or so) point receivers were nominated for each category. 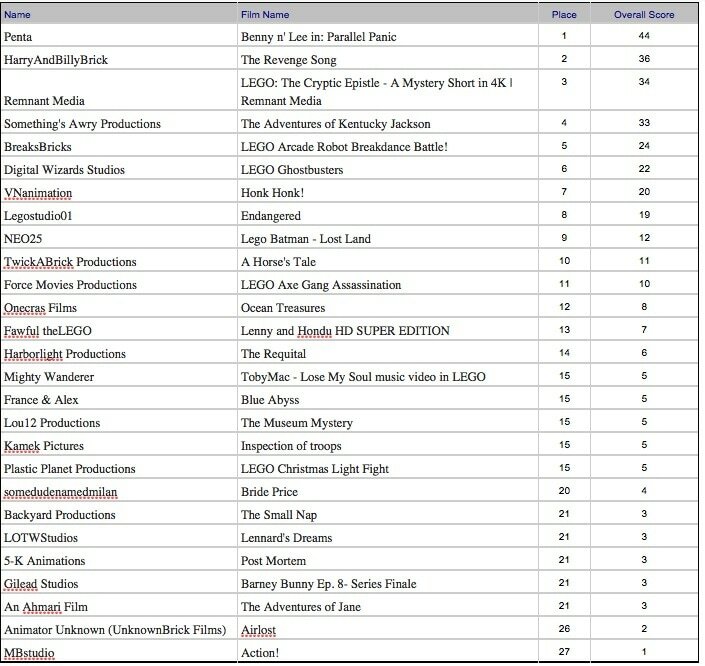 The exceptionally well made films got high scores in all categories and found themselves in the top 8 many times over. There are also a lot of entries that did not get nominated and are really good. Check out the entire playlist HERE. The awards show and podcast will include honorable mention categories. Quite a list of entries! HERE is the awards show video with the announcement of the winners. I'll do a blog with a listing of winners in the next day or so. Congratulations to all winners and thank you to the judges and brickfilmers that entered the festival. HERE is the news and events blog with the results. Flattered and Humbled that Trinity got 2 noms and one win. Congrats to the another winners and nominees. Congratulations to the winners and nominees! Thanks to the judges and special thanks to thefourmonkeys for organizing this. Huge thanks go out to the judges. David Pickett, Zach Macias, Mirko Horstmann, and Marc Andre Caron invested their valuable time scoring each brickfilm in the festival. Their scores gave us a clear winner this year. Here is a listing of 1-27 place. All other films basically got 28th place as they all had zero in the overall category which only means they did not finish in the top 10 for any judge. Congrats to all the winners. I've been waiting for the results for a while and I'm glad they're finally in. Wish I could've entered this great contest!